Update Thursday 01:45: we hit some unexpected problems with the non-Astro group shares. Everything is back now, please let us know if you expericence any problems..
and last for several hours. During this time, all our IT services will be unavailable, including login, e-mail, storage and ISG-hosted websites. Incoming e-mail will be kept back and delivered afterwards. We will give our best to have login and e-mail back up within the first two hours, but group drives will take a bit longer due to the sheer amount of hardware we have to move. We apologize for any inconvenience. Unfortunately, this migration cannot be performed on a weekend as we might have to interact with our colleagues at Informatikdienste, but it will ensure secure and enduring operation of our servers in the future. some impressions from the migration – thanks to the whole team! Update Thursday 07:15 – all systems back to normal. whew. 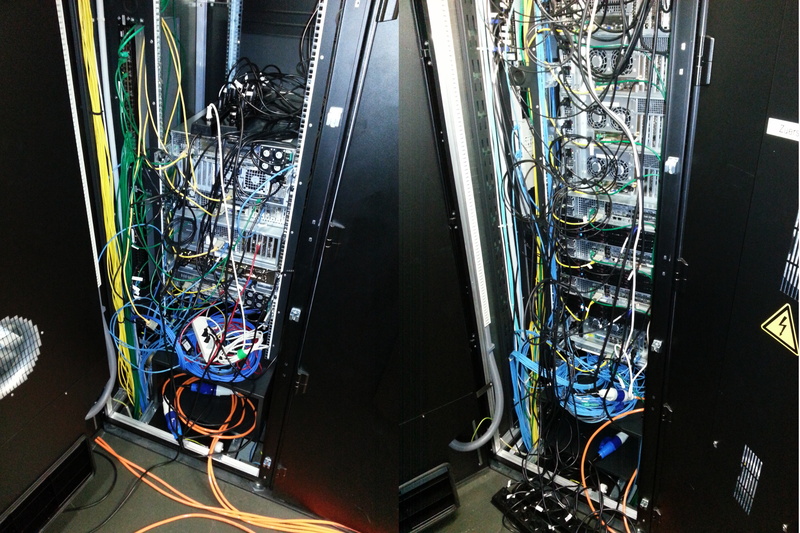 Update Wednesday 11:00 – first rack back to normal. The picture shows how it looked during the remodeling. 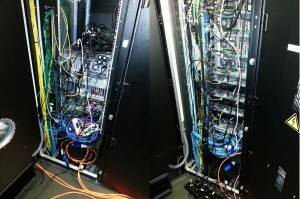 All of D-PHYS’s important servers (and services: mail, homes, SAN, web) reside in two water-cooled racks in HIT D 13. On Wednesday, August 20 those racks will have to be retrofitted by our colleagues of Informatikdienste since certain spare parts are no longer available. We have an elaborate plan how to externally power the servers while the racks are offline that schedules a 5-minute downtime that most of you won’t even notice. However, there is a small chance that this external power supply does not work as expected which would lead to a longer interruption. Unfortunately we have no influence on the date, time and procedure of this modification and can only try our best to minimize potential consequences. So if something should go wrong next Wednesday, please don’t panic, we’ll be hard at work to fix it ASAP.